A war memorial that was stolen from a Huddersfield mill has been returned. The plaque was put up at Newsome Mills in 1921 to honour seven mill workers who were killed in the First World War. It was stolen some time between February 10 and 21, but has now been returned to the Newsome Ward Community Forum. Following an appeal in the Examiner on March 1 the 87-year -old bronze plaque has been handed in to a member of the forum and is now in safe-keeping. Forum member Diane Sims said they were pleased to have the plaque back, but added that it had been badly damaged. Newsome Mills were founded by John Taylor in 1827 and was a working textile mill until 1983. The impressive four-storey mill and clock tower were built in the 1880s by worsted firm Taylor and Littlewood. All the buildings on the site have been Grade II listed since January after approval from watchdog group English Heritage. 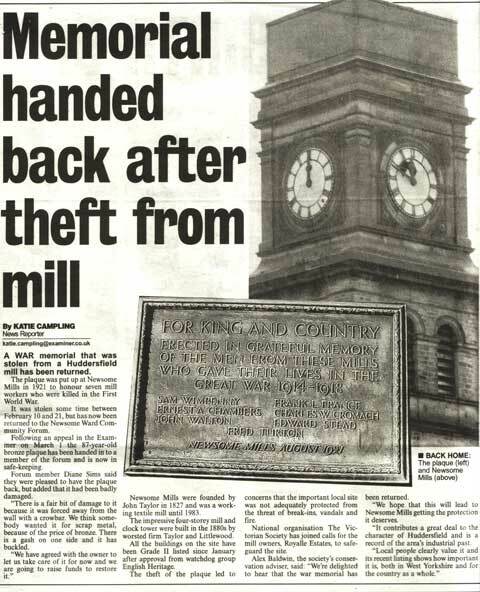 The theft of the plaque led to concerns that the important local site was not adequately protected from the threat of break-ins, vandals and fire. National organisation The Victorian Society has joined calls for the mill owners, Royalle Estates, to safeguard the site. Alex Baldwin, the society’s conservation adviser, said: “We’re delighted to hear that the war memorial has been returned. “We hope that this will lead to Newsome Mills getting the protection it deserves. “It contributes a great deal to the character of Huddersfield and is a record of the area’s industrial past.